Extrusion is the process of stretching a flat, 2D shape vertically to create a 3D object in a scene. 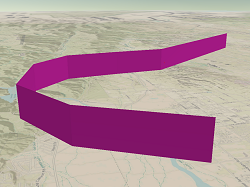 For example, you can extrude building polygons by a height value to create three-dimensional building shapes. Only points, lines, and polygons support extrusion. When you extrude a layer in the 2D Layers category in the Contents pane, it is moved to the 3D Layers category. You can only extrude a single layer at a time. If more than one layer is selected in the Contents pane, extrusion choices will be disabled. Point and multipoint features become hollow vertical columns when extruded, regardless of the point symbol applied. 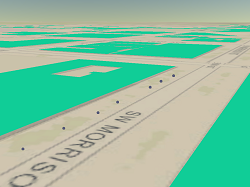 Extrusion is a good way to highlight locations in 3D. You can extrude points based on an attribute to create columns of different lengths to visually represent variability in the data. Extruded line features appear as walls. This can be an effective way to represent and highlight boundaries in 3D. You can extrude based on an attribute value to show walls of varying heights, which can be an effective way to represent the magnitude of flow or other movement. Extruded lines will appear as 1-pixel-wide walls, regardless of the width of the stroke symbol layer in the line's symbol. Polygon features are extruded vertically to create blocks. 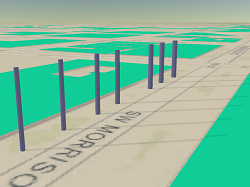 This is a convenient way to represent building footprints as 3D buildings. 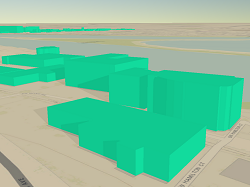 You can also extrude polygons by an attribute to create 3D prism maps, such as property prices, county population, or census block income. If there are outlines on the polygon symbols prior to extrusion, the extruded blocks will draw with a 1-pixel-wide outline on all edges in the color defined by the symbol, regardless of the outline width or other symbol properties set on the outline stroke layer or layers. Follow these steps to extrude features. Select the feature layer you want to extrude in the Contents pane. Under Feature Layer, on the Appearance tab, in the Extrusion group, click the Type drop-down arrow. Choose a feature extrusion type. Features are not extruded. This is the default. Add extrusion to each feature's minimum height. A z-value is calculated by adding the extrusion height to the minimum z-value of each feature. They are extruded to a flat top at that value. This option is not available for point features. Add extrusion to each feature's maximum height. A z-value is calculated by adding the extrusion height to the maximum z-value of each feature. They are extruded to a flat top at that value. This option is not available for point features. Add extrusion to each vertex of each feature's base height . A z-value is calculated for each vertex of the feature's base and each feature is extruded to those z-values. In the case of polygon features, top and base faces are created to connect to the extruded walls to construct a closed shape. Each feature is extruded to the specified z-value as a flat top, regardless of the z-values of each feature. Extrusion is a display property of the layer, so the individual symbol or symbols used in the layer will not reflect extrusion in the symbol properties preview window. When you set extrusion on a layer, you can choose to specify the extrusion unit for extrusion values. Under Feature Layer, on the Appearance tab, in the Extrusion group, click the Unit drop-down arrow. If the layer has a vertical coordinate system defined, the default extrusion unit is the vertical unit of the data source. Otherwise, the default extrusion unit is meters. To see the vertical unit defined for your data source, right-click the layer in the Contents pane, and click Properties. On the Layer Properties dialog box, click the Source tab and expand the Data Source heading. The extrusion text box is available if you choose any extrusion method except None. To define an expression in VBScript or Arcade, click the Extrusion expression button . Optionally, choose to apply any operators to the attribute value. 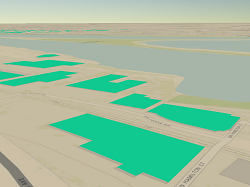 For example, if you have the height of each building floor as your attribute field, and you know how many floors the building has, you can add a multiplier to calculate building height.